It's hard not to agree that Joget Workflow's look-and-feel is aesthetically pleasing, in addition to shipping great codes to the open source space. To continuously keep up with the "simplicity" design goal, we continuously examine and improve user experience by enhancing the user interfaces. 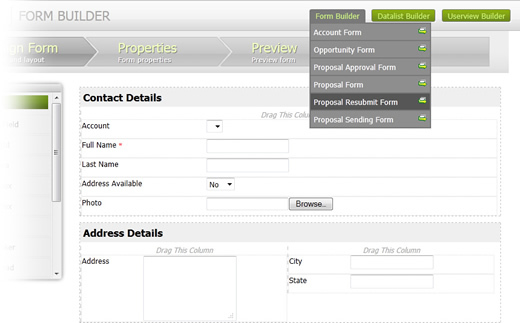 One of the recent examples, is the improvement in navigating between Form Builder, Datalist Builder and Userview Builder. This recent enhancement is committed in the latest snapshot of v3 Beta code-base, and will be available in the final release of v3. In v3 Beta, if we continuously edit and design the forms, data lists and userviews, chances are, we will most likely end up with a couple of tabs opened in the browser; and it could be many. This affects the user experience, navigating between the builders and forms eventually resulted in cluttered tabs. Now, 3 nifty quick-navigators are placed into Form Builder, Datalist Builder and Userview Builder. Each navigator is a drop-down list of forms, data lists, and userviews, respectively. So, instead of leaving your mouse cursor away from the current tab and open another form from the Workflow Management Console, in another new tab, we can now simply select another form from the drop-down list, and switch between builders without cluttering the tabbed browsing experience. When good is not enough, we aim to be better! If you can't wait to experience this improvement yourself, you can build Joget Workflow from the latest source codes. As we approach the 10th anniversary of the Joget open source project, the Joget team is proud to announce that we’ve hit the milestone of 200,000 open source downloads (not counting many more in enterprise downloads and cloud signups) before the end of March 2019! Joget is an open source no-code/low-code application platform for faster, simpler digital transformation. Joget combines the best of business process automation, workflow management and rapid application development in a simple, flexible and open platform. Visual and web-based, it empowers non-coders to instantly build and maintain apps anytime, anywhere. Joget started as the open source Joget Workflow project on SourceForge in 2009. Initially a workflow engine for business process automation, Joget evolved into a full-fledged application development platform in its third major release Joget Workflow v3 in 2011, back before the term “low code” was even coined by Forrester in 2014.